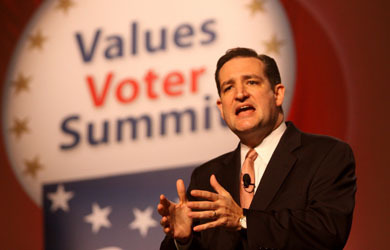 In recent weeks, Ted Cruz has really stepped up his efforts to become the Religious Right’s candidate of choice in the GOP primary, even partnering with radical Christian nationalist David Lane for a conference call earlier this week seeking to mobilize right-wing pastors to pressure Congress to shut down the government, if necessary, in the effort to defund Planned Parenthood. 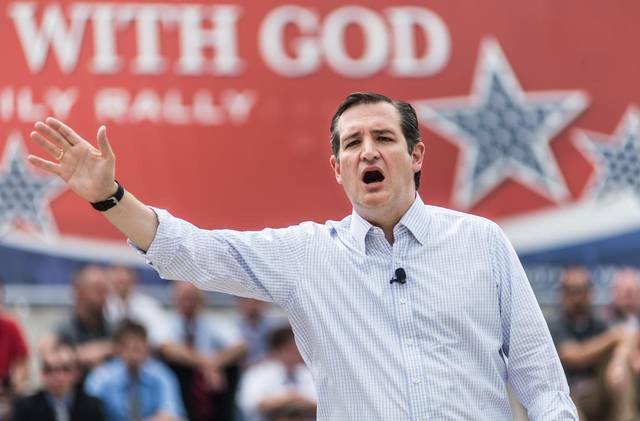 Cruz is continuing this effort by sending out an email today via David Barton’s WallBuilders network urging pastors to use their sermons this weekend to preach against Planned Parenthood and even providing a link to a sample sermon for them to use. Proverbs provides clear insight into God’s character. He has a personal hatred for seven things. God judges them to be so odious that they are an abomination to Him. His character will never allow His hatred of an abomination to evolve into a toleration of it. His children should be resolved to reflect His character, not to redefine it. The Wise give shape to their personal and national character by loving what God loves and hating what God hates. Fools worship gods created by their vain imagination. They drift from the compass of God’s character. Their ears become deaf to His voice and their hearts become calloused to the touch of His hand. Any accumulative error of moral judgment is disastrous on a personal and a national level. The abomination of any individual or any nation begins with the first act of disobedience to God. He finds rebellion disgusting, abhorrent and repugnant because it leads to a separation from Him and a loss of intimacy with Him. When an individual or a nation stiff arms the character of God and embraces an abomination as the law of the land, it ends in disaster. When rebellious people disregard the compass of the most powerful, it is a very short step to dismembering the bodies of the most vulnerable. Like other nations, America has taken that step. It is time for a turnaround. Recent videos exposing the gruesome practice of Planned Parenthood’s harvesting of the organs of babies from their mother’s womb. Exposing evil to the light of day has brought waves of sorrow to millions of tenderhearted people. Sorrow is redemptive only when it leads to repentance. Repentance requires a stopping point and a turning point. Without both there is no Spiritual Awakening on a personal or a national level. There must be a point in which the accumulative error of an evil decision thrust upon the nation by secularist jurists stops. It must be followed by a turnaround that is spiritual, not political. That day has come. Let the breath in your lungs be used to pray for it to begin in your own heart. A repentant person turns towards Jesus, and receives God’s forgiveness. A praying church mobilizes an army of repentant people calling on God to use His children as instruments to guide lost people and a wayward nation back to The Father. God can do more in five minutes, through the life of one obedient person than millions of rebels can accomplish in 50 years of their own effort. Be the one. The Victory is His. Pray for it. It is only a breath away. After you pray for your life to be back on course, pray for your Congressmen and Senators to hear from God regarding the ending of the slaughter of the innocent. Let them know that you are praying for them, and you are expecting them to do the right thing. You will no longer tolerate any excuse when they have the chance to vote to end government sponsored support of the murder and dismemberment of babies in this session of Congress. God hates it. You can stop it. For God’s sake, make it happen.